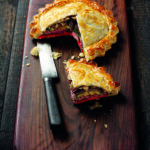 Venison Steak and Mediterranean Vegetable Pithivier – A Pithivier is a layered Pie. Take the red onion, peel it then cut into thin slices. Next take the courgette and aubergine and slice them into slices about 1 cm thick, then cut the pepper into quarters and de-seed. Add a little oil to a frying pan and fry off the red onion until soft. Add the balsamic vinegar and allow to reduce until it just coats the onion then put to one side to cool. Place the rest of the vegetables in a bowl, season and toss in a little oil. Using a ribbed griddle cook all the vegetables, apart from the pepper, for 2 to 3 minutes and then lay them on a plate to cool. Using the same method, cook the red pepper for 5 minutes on each side and then place on a plate and cover with cling film. This will help to soften them. Heat the same griddle until smoking hot then lightly oil the steaks, season and fry for 30 seconds on each side so that they have sealed on the outside but remain raw in the middle. R.oll out your puff pastry on a floured top to 4 mm thick then cut out eight discs. Cut four 15 cm in diameter discs for the base, and four 18 cm discs for the tops. Take all the vegetables and divide them into four lots. Place a layer of pepper one each of the smaller discs then a layer of aubergine, steak, courgette and finally red onion on top. Season each layer lightly. 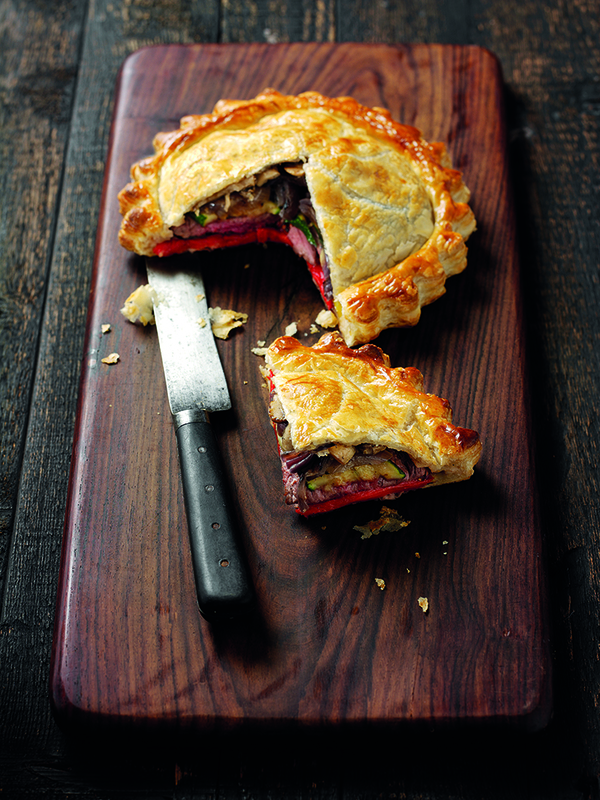 Press the vegetables and steak down lightly then brush around the edge of the pastry with a little beaten egg. Place the larger discs of pastry on top of the vegetables and steak, press the edges down and then crimp. Make a small hole in the middle of the top to allow the steam to escape. Place in a pre-heated oven at 200c for 15 - 20 minutes or until the pastry turns golden brown.